Sixty-two years ago, at the age of 19, Clarence Werner moved to Omaha, NE, and sold his car to purchase a Ford F800 truck. Starting with that lone truck, he established a small business and began hauling everything from watermelon to fence posts across the Cornhusker State, eventually expanding to more areas, more vehicles, and more drivers. Today, the company he started, Warner Enterprises, operates a fleet of more than 7,000 trucks and employs nearly 10,000 workers—and this year, those vehicles and those drivers are seeing some significant changes thanks to tax reform. “With the tax cuts, we’ve been able to increase our capital investment this year by $127 million, 90 percent of which is dedicated to trucks and trailers that are cleaner, safer, and better for the American roadways,” Werner Enterprises CEO Derek Leathers said at an event earlier this month at the White House Rose Garden. That’s a massive windfall for Werner’s workers. Speaking at the same event, Quinton Ward, an Army veteran and Werner driver, explained that the paycheck boost will allow his family to finally take a trip they have been planning for years. “This tax law means a better future for me and a significant pay increase this year,” Ward told President Trump. He’s not alone. A survey of American Trucking Associations members earlier this year revealed that half of carriers were planning to increase wages or offer bonuses as a direct result of tax reform. In addition, 47% percent plan to invest in new equipment, including trucks, trailers, and safety technology. America’s trucking industry—it’s worth noting—employs more than 3.5 million drivers and moves more than 70% of all the U.S. freight tonnage. 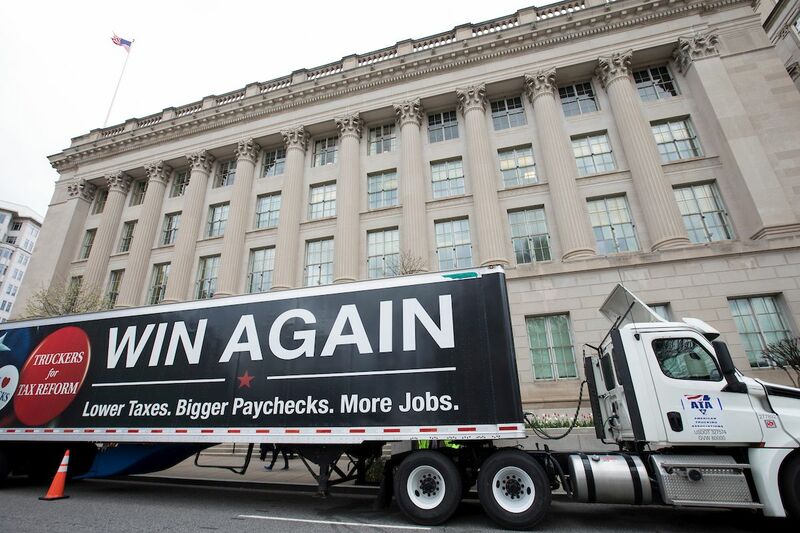 Only a few days after the White House event, the trucking industry was one of several industries represented at an event at the U.S. Chamber to explore the benefits and implementation of tax reform. We were proud to welcome Sen. Pat Toomey of Pennsylvania, two small business owners, as well as representatives from the American Trucking Associations and the American Electric Power Company, all of whom offered a different lens on the ways tax reform has benefitted America’s economy. Approved by Congress at the end of 2017, the Tax Cuts and Jobs Act—the first major overhaul of our nation’s tax code in a generation—has cut rates for businesses of all shapes and sizes, allows for full expensing of investments, and establishes an internationally competitive tax system. At the same time, 90% of workers, just like Ward, are now keeping more of their paychecks, not to mention the countless companies that have invested back into their employees through raises, bonuses, and other forms of increased compensation. Following a jolt from tax reform, that engine is humming.